Kitchen lighting in the not to distant past, was nearly always a ‘fluorescent’ strip light, very practical lighting but ugly as sin! Times have changed somewhat and many of us enjoy open plan kitchen dining rooms or kitchen living rooms or kitchen family rooms. We want kitchen lighting with more style. Kitchen Lighting still needs to be practical and easy to clean but we want it to be pretty too! We want it all! And why not! There are plenty of attractive kitchen lights to choose from. A recent trend to have open plan kitchens, has often prompts the question “what is the best type of light for a kitchen?’ It is difficult to choose from such a large selection of kitchen lights. 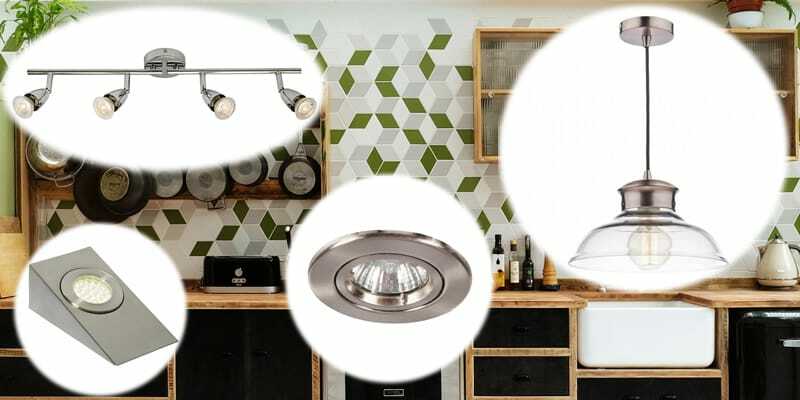 At the lighting company, we thought it was about time to point the spotlight at ‘Kitchen Lighting.’ We’ll give a few options of kitchen lights for your consideration. We have lights that are a good alternatives to the old fashioned strip light. We offer some helpful information we hope will assist you to make an informed choice for your next kitchen lights. The most popular form of lighting here is of course spotlights but there is a surge in popularity for pendant lights, these are perfectly suited if there is a dining area. It’s definitely worth investing in good lighting as kitchens are the heart of the home. How we use kitchens has changed, they’re often far larger than in the old days to be inclusive of family activities. Multi functional lighting has taken over from utilitarian styles of our parents generation, this shift has prompted us to revise our offering across the range we now have. Effective lighting for a kitchen may consist of a central ceiling light or ceiling lights to provide general lighting. Along with under cabinet lighting to provide light to the worktops. It can be equally effective using wall lights where there are no wall hung cabinets. The basics building blocks for good kitchen lighting is to have a general light and extra lighting to illuminate the worktops or working surfaces in the kitchen. Every kitchen is different some large, some small, some country kitchen and some modern minimal. The basics of lighting all types of kitchens remains the same, plenty of light is needed. It is better to have too much light than not enough. You could always turn the lights down by dimming them or use lower wattage bulbs. Adding extra lights later is always more costly and you don’t want this to freshly decorated rooms. If you have the chance to design your kitchen lighting scheme from scratch you can do a whole lot more. Under cabinet lights provide extra light where it’s needed. If you’re trying to decide how to light up your work surfaces check out our other blog: Kitchen Lighting – Above and Beyond the Predictable. A great mix of over, under and hanging lighting. Firstly; How much light is needed? Measure your kitchen times the length by the width to get the square meterage, then times this by 25. For example if your kitchen is 4 meters by 5 meters that equals 20 square meters times 25 gives you 500 watts of light is required. This figure is your basic light level required for general lighting. The rest of the light is to give you extra light where you need it most. Let’s look first at kitchen ceiling lights. Recessed lights are popular. 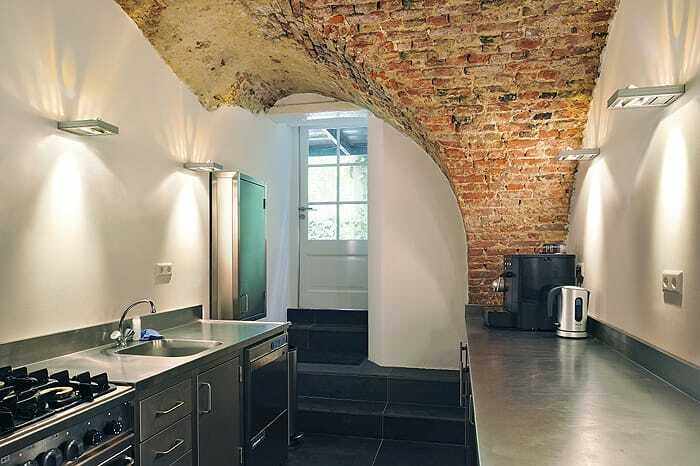 They are sunken into the ceiling and provide a modern kitchen lighting scheme. Recessed lighting is ideal for kitchens and many other rooms too. Recessed spotlights are often halogen bulbs but can be fluorescent bulbs or Light Emitting Diodes (Led) Bulbs too. The benefit of lighting your kitchen with recessed spotlights or down lights as they can be know, is they are unobtrusive. Flush with the ceiling lights give a modern fresh look to the kitchen. Recessed lights are a good choice for kitchens with lower ceilings. Recessed lights can be spread evenly across the ceiling giving a good coverage of light. Or alternatively used in groups above worktops. There are some recessed light that shine straight down and others that you can angle a little. The recessed lights that can angle or tilt can be useful to throw light towards a wall, washing walls with light and creating an attractive feature. There are lots of different variations within the range of recessed spots, although to the untrained eye they do look the same. Firstly the colour options chrome, satin silver or white but there are also differences to the specification of the recessed lighting that is not always easy to see. We advise avoid buying flimsy recessed spot lights as often they have too many breakable parts. Some that from experience we feel are best avoiding are the one’s with tiny little spring clips that ping across the room, never to be found again, when you the bulbs are being changed. Instead opt for a die cast metal. Always choose a model that has an integrated fire and acoustic hood. Integrated fire hoods look a bit like a can or cylinder behind the fitting. Fire rated recessed spotlights are generally a few pounds more, but well worth it! The integrated hoods help retain the fireproof rating of ceilings. In the event of a fire, the expandable seal this fills the gap made in the ceiling by the lights and puts back the barrier between the ceiling and light fitting. This effectively plugs up the hole and protects the floor above. Separate fire hoods can be fitted to the cheaper recessed lights although, it can be more expensive to buy them as separate items. The integrated fire hoods also have an acoustic rating, which is often required for new homes under the current building regulations. 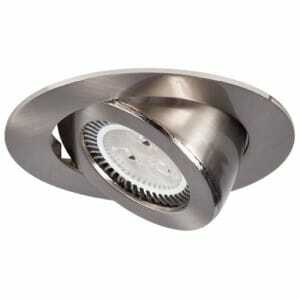 Recessed light fitting adjustable angle can be used to wash walls with light. There are low voltage recessed lights and mains voltage recessed spotlights to choose from. Our recommendation, a few years ago, would have been opt for low voltage. This is no longer the case. With the introduction of LED bulbs we as lighting professionals have changed our tune. Today we’d recommend choosing mains voltage recessed spot lights for kitchens. The mains voltage are being dubbed ‘future proof’ by many. 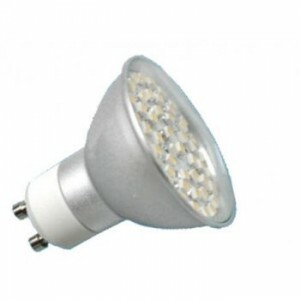 The reason is, mains voltage spotlights (GU10) light bulb manufacturers have invested heavily in production of better and better quality GU10 bulbs. There are mains voltage LED bulbs, fluorescent and halogen bulbs. Bulbs are an ever changing commodity and improving constantly as manufacturers strived to be evermore aware of energy consumption. If asked for a recommendation, we’d always say choose led bulbs.LED Bulbs such as the GU10 LED bulb that we sell, are so much cheaper to run. LED bulbs can be dim-able and non dim-able. There are versions that give warm white colour of light, a cool white and natural white from £12 each. If you choose to light your kitchen with recessed lights mount them slightly forward of wall hanging cabinets, this will help get more light into the room. There are various options for kitchen ceiling lights, it doesn’t have to be recessed. There are surface mounted spotlights bars too. Spotlight bars offer you flexibility you can point the light where you want it to be. Keep in mind spotlights are just that, spots of light. They create interest by having a contrast between light and shade. A word of caution, if you are replacing a fluorescent strip light for spotlights you may find you’ll need more than one fitting. Fluorescent lights tend to give 5 times more light than they state. As an example a 5 ft light will say 58watts which seems fairly low, however they actually give almost 300 watts of light. If you buy a spotlight bar to replace that it would be advisable to have a spotlight bar with 6 spotlights on it. Alternatively have 2 spotlight bars with 3 lights on each otherwise you’ll be always in shadows. You may still prefer fluorescent lighting, for your kitchen. If so, there’s a new breed of fluorescent lighting. It’s designed to be attractive to look at, as well as being environmentally friendly. It’s aesthetically friendly too! These fluorescent fittings, do however, come at a higher price. The design and materials used are more expensive. Production costs are now higher, the lights often made from glass and chrome, some are still a polycarbonate but have been designed by prestigious designers and all that comes at a cost. Fluorescent is deemed trendy now, a change from the basic utilitarian cheapness of the past. Fluorescent lights while energy saving and hailed as eco friendly do contain harmful chemicals.Because of this the need to be disposed of carefully. Fluorescent tubes contain a gas which when inited glow brightly. The inside of tubes contains a white powdery coating which can have up to 5mg of mercury, it’s a relatively small amount. This can of course still be very harmful, but to put this into context thermometers are 3,000mg. Fluorescent is still a popular and an effective form of lighting. You’ll simply need to take great care when disposing of fluorescent lights. Advise can be found at recycling centres. ‘Flush fitting’ ceiling lights can also provide a good general light. Flush fitting kitchen lights fit flat on the surface of the ceiling again great for kitchens with a lower ceiling height. Often flush fitting lights are called bulkhead or porthole lights. There are various names but they are all flat to the ceiling lights, normally with a glass cover over the bulb. Many people feel this is what a kitchen light should be, functional and practical. While others want there flush lights to be mode modern and make a statement! The Lighting Company have plenty of modern kitchen lights to choose from. Be brave and get creative, kitchen lighting can actually be any kind of light fitting. If you want to you can have a chandelier above your kitchen island. There are no rules that say it has to be a kitchen style light anything goes you are not restricted to a certain selection. 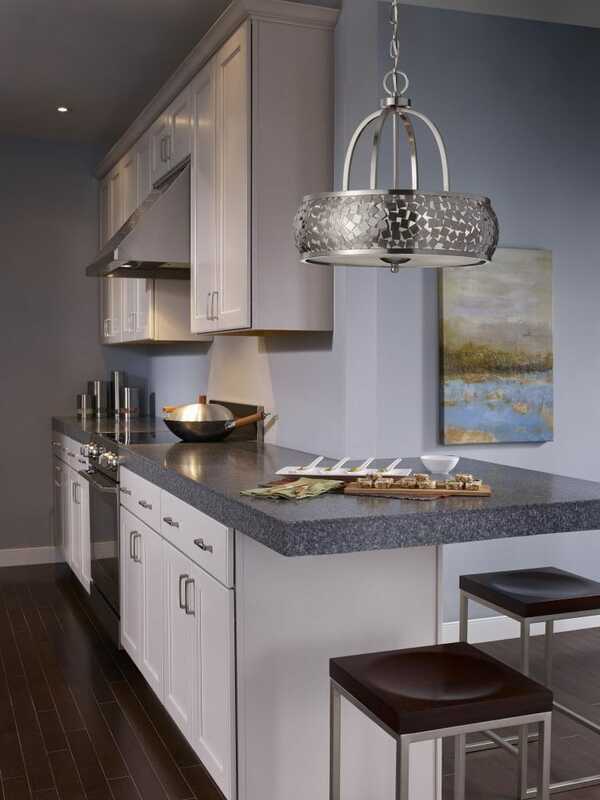 If you’re looking to light your kitchen island with pendants then check out our other blog. 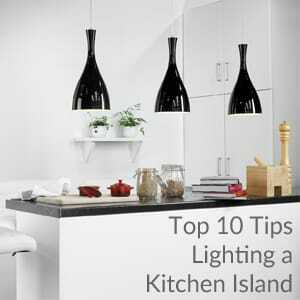 Lighting a kitchen island 10 tips to choosing the perfect pendant. In larger kitchens you could have feature lights above a tables, breakfast bars or central islands. This can add real impact. Pendant kitchen lights give a chance to add a splash of colour to a modern kitchen. Or add a rustic pendant to a country kitchen to show individuality. In smaller kitchens is isn’t always possible to have large pendants but smaller shorter pendants are available too. If you simply don’t have a spot for a pendant light to hang consider a decorative spotlight bar instead. 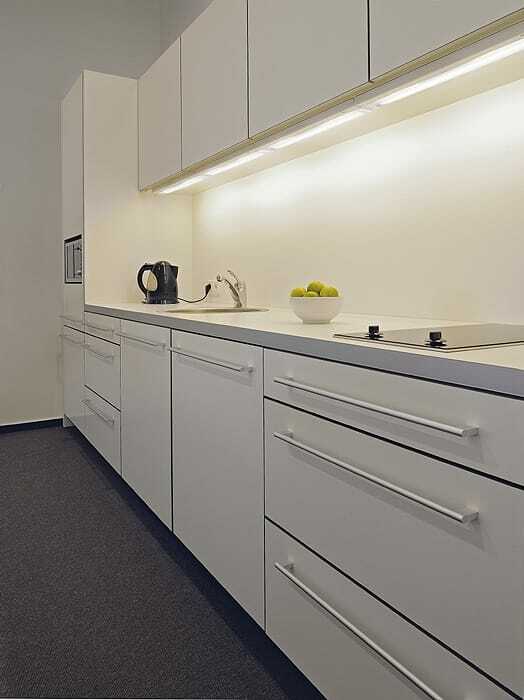 For a modern kitchen why not consider incorporating lighting below the kick boards of your kitchen units? This works particularly well with reflective glossy surfaces either units or floors. LED is best as it cooler to the touch, best to choose a waterproof light for this application as kitchen floors get wet. 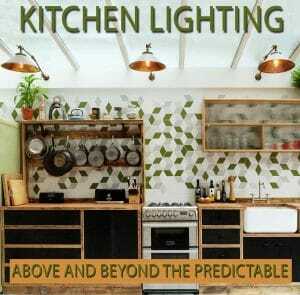 Always use waterproof lighting at lower levels in kitchen it’s safer. We highly recommend LED tape, it’s fun, modern, low energy and waterproof a lovely addition to a modern kitchen. 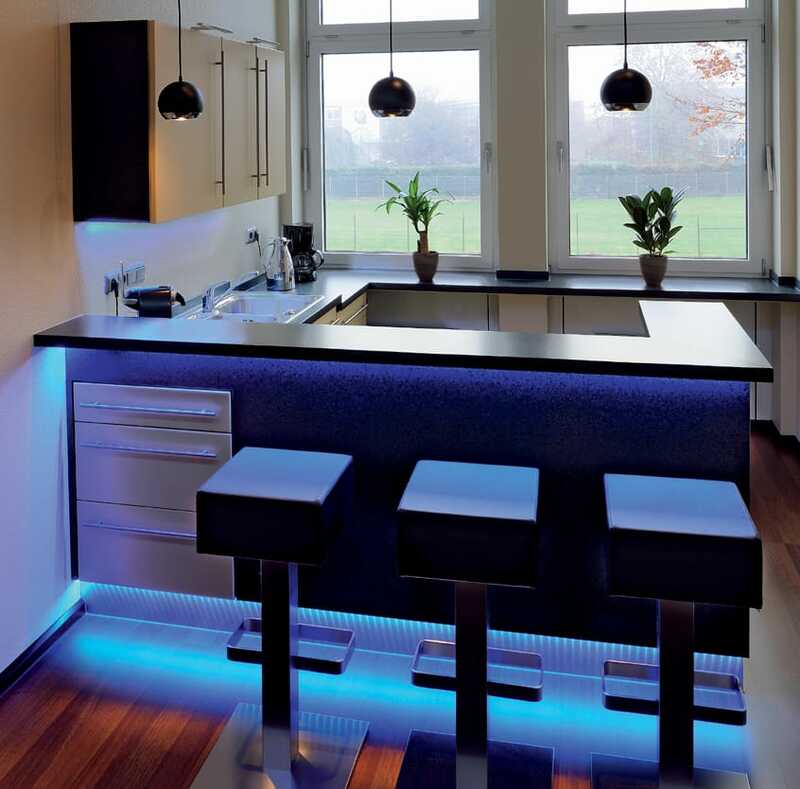 We really like LED Tape for a modern kitchen with below the kick board or above tall cabinets works best. Colour changing version of LED tape (or strips) are available too. If your kitchen is more country kitchen or classic style perhaps hang a small rustic pendant above the sink or a decorative wall light to create a quirky salvaged look. If you have any free space in the kitchen or if you are lucky enough to have a dresser add a little table lamp, glass lampshades are best for kitchen as fabrics can be more difficult to keep clean. 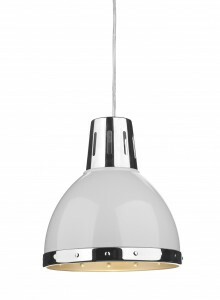 White pendant light POLAR ideal choice for kitchen lighting. ← Previous Previous post: Shedding Light on Reading and Task Lamps! Next → Next post: Lighting UK the best of British!